Writing your own content for your mortgage website blog can be pretty time consuming. People often look to outsource the writing to another company. In this post we want to cover how to best utilize mortgage blog content that is provided by a service. If you are paying a company to write mortgage blog content for your website make sure you are doing this step. Tweak the content to target your market. This will probably take you 5 minutes and it is worth it. If your goal is to appear to your clients that you are a wealth of knowledge than you can ignore this post. 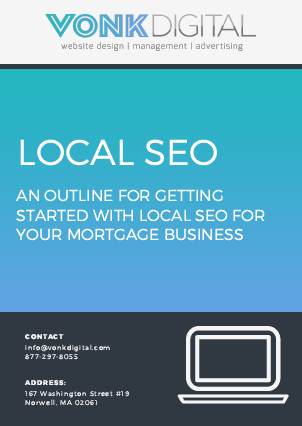 If your goal is to boost your local search engine results AND appear to your clients as a wealth of knowledge at the same time. Then take the extra step to tweak the content as it may pay off in the long run! If the blog title is “First Time Home Buyer Tips”. Change it to “First Time Home Buyer Tips for San Francisco” or something similar. Then take it a bit further and mention the key word phrase a few times within the article. That simple tweak may help your local SEO ranking. Whenever you are writing or tweaking blog articles try to speak to the people in the area. If your company is licensed in California, you want the people in California searching for information on mortgages to find you. If you are licensed in multiple states then this can be a bit trickier but still worth the effort. Mortgage Website Blogs – Do they work?